Get some historical perspective at Chenrezig Institute and Sunshine Castle. You'll get in some beach time at Peregian Beach and Marcoola Beach. 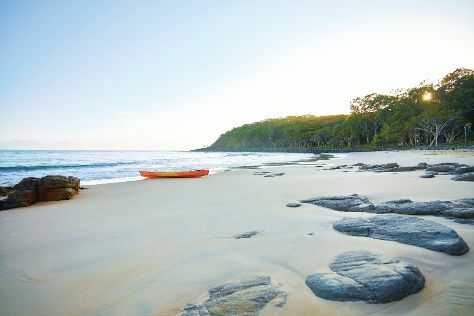 Get out of town with these interesting Mooloolaba side-trips: Artworks in Clay by Anne Gentry-Smith (in Montville), Gardners Falls (in Maleny) and Noosa (Noosa National Park & Noosa Main Beach). The adventure continues: explore the striking landscape at Mount Coolum, enjoy the sea views from Caloundra Lighthouses, tour the pleasant surroundings at Wirreanda Park, and see the interesting displays at Queensland Air Museum. For where to stay, ratings, more things to do, and other tourist information, refer to the Mooloolaba trip planner . Adelaide to Mooloolaba is an approximately 5.5-hour flight. You can also do a combination of flight and bus; or drive. Traveling from Adelaide in March, expect a bit warmer with lows of 23°C in Mooloolaba. Wrap up your sightseeing on the 8th (Fri) to allow time to travel back home.